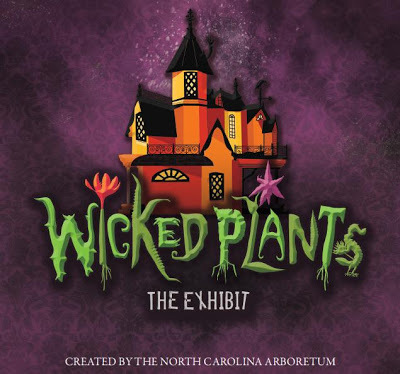 If you’re into unique and interesting plants, here’s a rather unique and interesting exhibit to see while you’re in our neck of the woods — Wicked Plants — based on Amy Stewart’s best-selling book, Wicked Plants: The Weed that Killed Abraham Lincoln’s Mother and other Botanical Atrocities. The exhibit is showing at the North Carolina Arboretum in Asheville through September 3.
of pain, poisoning, paralysis or passing on. The North Carolina Arboretum is one of our favorite places, with more than 430 acres of gardens and trails in a gorgeous mountain setting, an education center and exhibit hall, and super nice staff and volunteers! It’s also very close to one of the entrances to the Blue Ridge Parkway. This entry was posted in Uncategorized and tagged Asheville, festivals and special events, flora and fauna by Inn on Mill Creek. Bookmark the permalink.